9:07- Portland’s Damian Lillard looks fired up. It’s upsetting that he was an All-Star snub. His defense may not be professional grade yet, but in this day in age in the NBA, is anyone’s? 9:09- A LOT of Eastern Conference rookies and players in general. It just goes to show how difficult it is to move up the ranks and be recognized in the Western Conference. It also just goes to show how much harder Lillard has had to work to get so much recognition in his first year. 9:16- Team Shaq game plan: break the record of 155 points set in 2007. Good game plan. A lot of points usually helps you win these kind of events. Usually. 9:19- Sophomores up early; they’ve scored the first two buckets in the game. Even though it’s technically intrasquad, you’ve got to imagine that this sophomore class is furious by all the talk of them having a “weak” draft class. 9:19- New Orleans’ Anthony Davis is trying to make his case for Rookie of the Year honors…with a three-pointer. That is not a typo. 9:19- Not to be outdone by his biggest competition for ROY, Lillard sinks a three on the very next possession. 9:20- Davis might get there someday, but he’s not there yet; 1-2 from 3-point land. 9:21- …and now he doesn’t. 9:22- Charlotte’s Michael Kidd-Gilchrist with the nice fadeaway over his former UK teammate Davis…that still has to be such a strange feeling facing each other after all they went through in college. Granted, they only attended school for a year together, but they did some pretty incredible things during that time. 9:24- Barnes sinks a contested three. 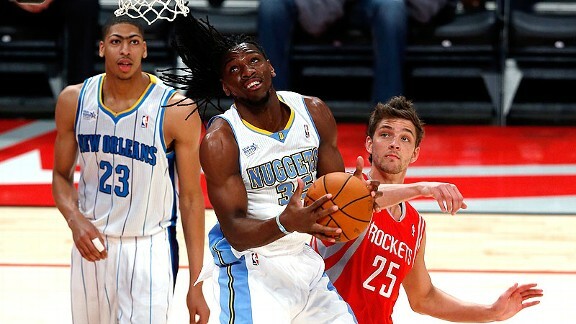 The man is all about professionalism; showing poise even in a Rising Stars Challenge. 9:24- I have a feeling this is going to turn into the Davis-Lillard show pretty quickly; Lillard drives down the lane and flushes it for Team Shaq. 9:29- Davis already has seven rebounds. There are still 12 minutes left in the first half. This is insane. 9:32- I’m getting tired of this James Bond Skyfall commercial already…of course they’re gonna say it’s the best Bond ever; they want people to buy the movie! Tell me something I don’t already know. 9:34- Rookie mistake of the night: Cleveland’s Tyler Zeller was just rejected…by the rim. That man needs to start playing as if he’s actually seven-feet tall. 9:35- Unconventional, yes, but Kidd-Gilchrist’s shot is doing him good so far. 9:36- Zeller redeemed himself by finishing strong at the rim with a dunk. There really is no other way to finish in a Rising Stars Challenge game than by dunking. 9:37- Rookies aside, Team Chuck is absolutely dominating; they already have 46 points. Also, in case you’re just tuning in, there are still nine minutes left in the first half. 9:37- Back to back dunks for a few high flying rookies: Cleveland’s Dion Waiters followed by Minnesota’s Alexey Shved. It’s hard to tell where these guys could both be in a couple of years down the road, but for right now, it’s nice to see them here at the Challenge making plays and making names for themselves. 9:42- MKG turning on the jets now. On the fast break, he looked like he was going to send it home; instead, he served it up to Golden State’s Klay Thompson for the throwdown. With that said, it was a great first half, and a great game overall. Congrats to #TeamChuck on another solid victory, but in the end, being able to watch the young guns of the League take control of basketball fans’ attention was good, as it gave many of these rookies (and sophomores) their respective due. In basketball, you win some, and you lose some. Tonight, watching these rookies flourish, we here at NBA Rookie Class were all winners. This entry was posted in Buzzer Beaters, Halftime Entertainment, Home and tagged #TeamChuck, #TeamShaq, Alexey Shved, All-Star Weekend, Anthony Davis, BBVA Rising Stars Challenge, Cleveland Cavaliers, Damian Lillard, Denver Nuggets, Dion Waiters, Golden State Warriors, Harrison Barnes, Kenneth Faried, Klay Thompson, Michael Kidd-Gilchrist, Minnesota Timberwolves, MKG, NBA All-Star Weekend, nba rookie, NBA rookies, New Orleans Hornets, Portland Trail Blazers, rookies, Team Chuck, Team Shaq by NBA Rookie Class. Bookmark the permalink.